Sturdy 3/4" wood construction with stain-resistant laminate finish. Slanted reading surface with pencil tray and cushioned wrist support/paper stop. Side shelf pulls out on left or right to hold equipment or notes. 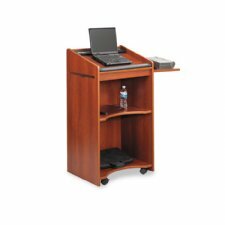 Two curved interior shelves allow speaker to stand close to the lectern. Smoothly mobile on four swivel casters (two locking). Easy assembly with cam-lock fasteners. 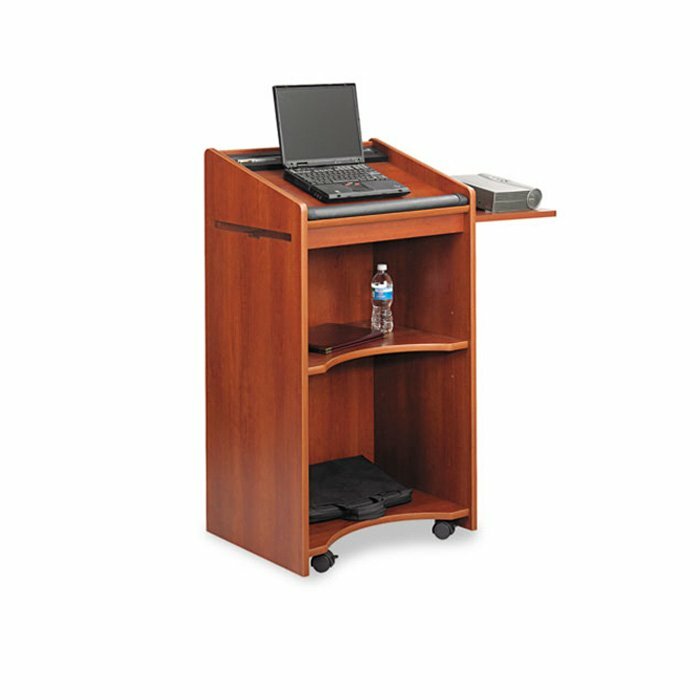 Two curved interior shelves allow speaker to stand close to the lectern. Smoothly mobile on four swivel casters (two locking). Overall Width : 25 1/4"
Shelf Width : 15 3/4"; 23 1/2"
Shelf Depth : 15 3/8"; 14 1/4"
We pledge to repair or replace, at Safco's option, any Safco product or component that is defective in material or workmanship for as long as you, the original purchaser, own it. This warranty is subject to the provisions below. Five Years Glides, casters, and polymer-based components, user-adjustable work surface mechanisms, seating upholstery fabrics, foam, laminates, veneer finishes and other covering materials, drawer glides and power strips. Freight damages; Safco is not liable for any product damages sustained during shipping or handling operations. Safco provides specific policies and requirements regarding shipping and handling and reserves the right to review and address product distribution matters separately. misuse of the product or its components. Safco's warranty obligation is limited to normal use upon receipt of our products. Normal commercial usage for seating is defined as the equivalent of a single shift, forty (40) hour workweek. To the extent that a seating product is used in a manner exceeding this, the applicable warranty period will be reduced in a pro-rata manner. Please follow the warranty procedures described below to ensure aptly responsive service. Once a defect has been discovered, the original purchaser must contact Safco immediately (within 30 days of defect detection) with the serial number(s) from the product(s) in question. Upon inspection of the product(s), Safco will collect all relevant information necessary for review of the request. Product replacement, replacement parts, and repairs will be authorized by a customer service representative if acknowledged to be necessary under product warranty eligibility conditions. Natural products have varying grains and colors. Due to such natural variations occurring in materials such as wood and leather, these characteristics are not considered defects. Safco does not warrant the color-fastness or matching of colors, grains or textures of such materials. Materials supplied, selected or provided by the customer (COM) are not warranted. THERE ARE NO OTHER WARRANTIES, EXPRESS OR IMPLIED OTHER THAN THOSE CLEARLY STATED HEREIN. ALL OTHER WARRANTIES, EXPRESS OR IMPLIED, INCLUDING WITHOUT LIMITATION ANY IMPLIED WARRANTY OF MERCHANTABILITY OR OF FITNESS FOR A PARTICULAR PURPOSE ARE DISCLAIMED. Buyer is responsible for freight to and from factory on all warranty claims. Any description of the goods sold here under, including any reference to Buyer's specifications and any description in catalogs, circulars and other written material published by Safco, is the sole purpose of identifying such goods and shall not create an express warranty that the goods shall conform to such description. SAFCO WILL NOT BE LIABLE FOR INCIDENTAL OR CONSEQUENTIAL DAMAGES NOR FOR ANY SUM IN EXCESS OF THE PURCHASE PRICE.